I had dinner with a friend the other night who has recently become excited about the wonderful world of wines out there just waiting to be tried. He said he never realized how many different kinds of wine there were, and how good they could be. I told him welcome to the club! We met at Macaroni Grill, which has a so-so wine list but we were looking to just catch up on the few months it had been since I'd last seen him, and we didn't want to spend a fortune on anything anyway. Here's some pictures of the food. 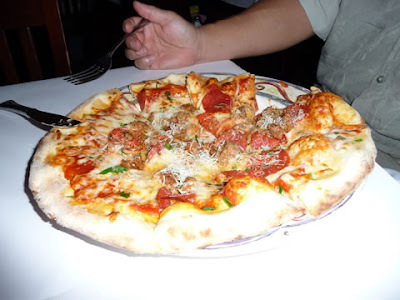 First is a Sicilian combo pizza that Mike had. Looks yummy, doesn't it? 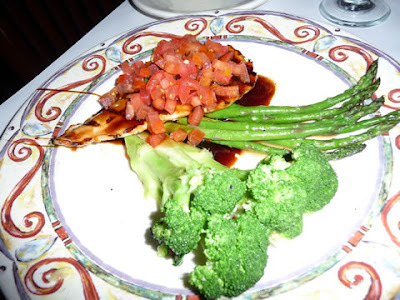 MG has six different $11.99 specials - you have your choice of three kinds of salad, six entrees and three desserts. I asked the waiter if the portion size was different for the special than ordering it a la carte and he said no, so I figured why not order the special. 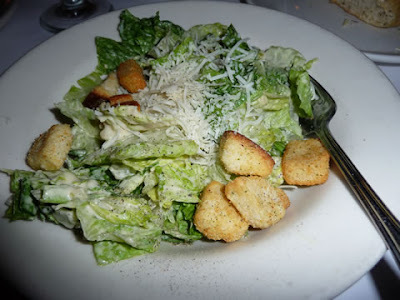 Here's my caesar salad. Nothing exciting, but it did taste good and was fresh and crisp. And I ordered pollo magro (or something like that) for the entree. It was the lowest-calorie item on the entire menu, something I decided to get because (a) I had about 10,000 calories in soul food over the weekend and thought it best to recover; and (b) I had looked at MG's menu online that afternoon along with the nutritional info and it was horrifying. I got scared into ordering the pollo! Here's a picture of it. It wasn't bad although the chicken was a little tough and the chopped tomatoes on top did nothing at all for the dish because they had no taste. But the sauce was good and the veggies were fresh and tasty. The wine list is a little better than average for a chain restaurant. Mike ordered a glass of Penfold's Shiraz, which he liked, and I orderd a glass of Chalone chardonnay. No vintages, not much detail and we didn't ask. I am sure mine was the Monterey County bottling and not the estate. It cost $7.99 for a glass, that glass being one of those "cheater" glasses that has a pointed bowl. I'd guess there was about 4 or 5 ounces of wine in it. Not a bad profit margin for them considering the wine must be below and maybe well below $10 a bottle their cost. The Penfold's was $7.29 for a glass. The Chalone got better as it warmed up. It was lemony with ginger, spice, pear and oak in pretty good balance. I was satisified with it. Mike mentioned a few of the wines he's tried lately, all from Costco: The Marquis Philips Sarah's Blend, a Nebbiolo, a couple that I can't remember, and the one he said stood head and shoulders above the others, the 2005 Caronne St. Gemme. That one I have sitting in my collection and I've been looking forward to trying it although I wasn't sure when to open it. No accompanying YouTube for the Chalone; I was focusing more on our conversation, which was a very good one! I'm still on summer vacation, just doing wine reviews until the inspiration hits me to do more of the silly-type posts I was doing before. Meanwhile, at least there have been some worthwhile wines to write about! This one is no exception. Lovely dark color, it had pleasing aromas of white chocolate, smoke, plum and stone fruits balanced out by oak. On the palate add graphite and juicy lemony acidity that literally made my mouth water. The wine had a silky texture, integrated tannins and excellent balance. I liked it because of the clean expression of fruit and that squirt of acidity that made it never tiring to drink. The only negative was a fairly short aftertaste but the plusses far outweighed the minuses. For $16.99 from Garagiste, this was a very well-made wine that was worth the cost. Two thumbs up! And now here is the matching YouTube music video (and as always, click here if you don't see it below). Sorry, no wine-related post today. It's break day. But it's food-related, the next best thing! 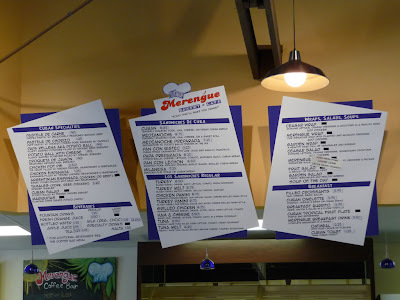 I recently found a thread in Chowhound about a new restaurant called Merengue that had a Porto's-like menu. 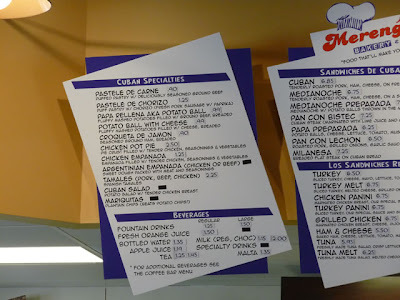 For those of you outside of Southern California, Porto's is a famous bakery and cafe in Glendale (with a more recently-opened branch in Burbank) that has many Cuban-type items on its menu. It's perpetually crowded and finding parking and seating can be a big pain. 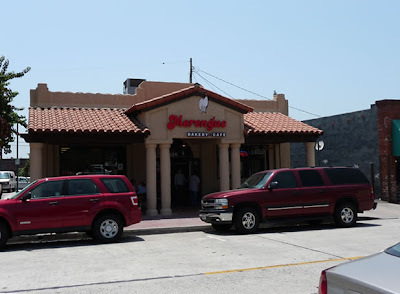 I told my wife about Merengue and since she works only a couple of blocks from it, she tried it during the past week and told me it was good. So off we went on Saturday to have lunch over there. On top you see the exterior. There's a small patio area and a larger area indoors. You order at the counter and take whatever is already prepared, or if it has to be made then someone brings it to your table. Here's a shot of the interior. I forgot I had my camera set to prevent flashes, so it didn't come out very bright, although the inside has plenty of light and has a nice, open look and feel. Previously the spot was occupied by a cajun restaurant that was much darker and dreary inside. It's been brightened up considerably. Here is a picture of the menu. If you click on the picture you will get a larger version that is easier to read. Or if you are too lazy to click, here's the left, center and right menus more close-up. As you can see, there is a nice variety of food and the prices are very reasonable. Unfortunately not everything on the menu is available yet. They also had some delicious-looking cakes and pastries in the case but as my flash was not working, the pictures came out too dark and I didn't want to publish them because it wouldn't do the food justice to look that dark. Getting to our lunch, we didn't order much but it was nevertheless filling. First, potato balls. 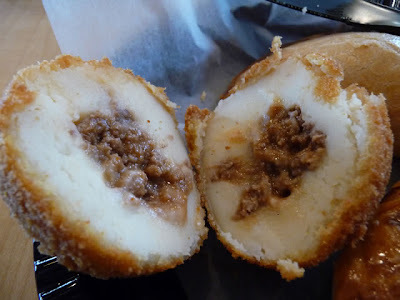 Now when anyone mentions "potato balls," immediately I think of Porto's. These were very good. The outside had a good crunch to it that contrasted nicely with the creamy mashed potatoes inside. In the very core was a portion of seasoned ground beef. It was just like Porto's version. If I had the two side by side maybe I could tell the difference in taste, but to me they are similar, which is to say very, very good. 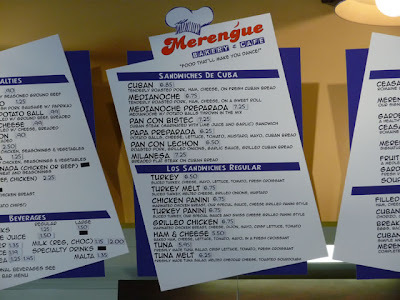 In fact I think I would give the nod to Merengue's as far as the texture of the outside crunch and the mashed potatoes. And the price? Only 99 cents! 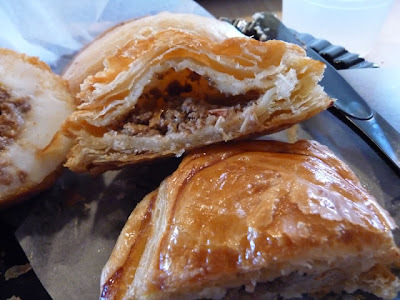 Next was the Pastele de Carne, puff pastry filled with seasoned ground beef. The pastry was nice and flaky, and it was a tasty dish on the mild side. For only 90 cents each, this was another bargain. 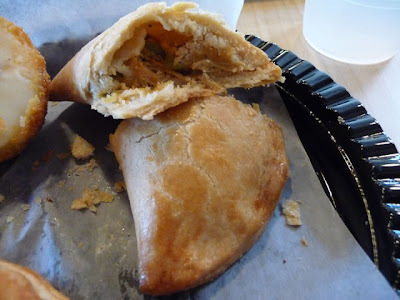 The most expensive item we ordered is shown below: a chicken empanada. Again, this was a tasty little finger food and only $1.25. And there you have it. It doesn't look like much - I had one of each of the items above and honestly, that was enough food. 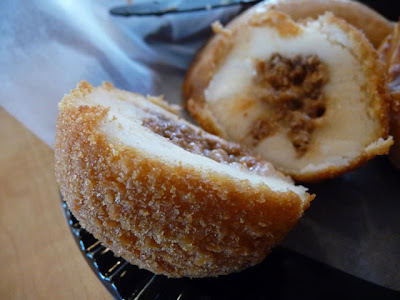 But then we split another potato ball, not because we were still hungry but because it was good so we wanted another one. The total bill for two of us was ridiculously cheap, and you can do the math since I listed the prices above. We certainly plan on going back to try other things. 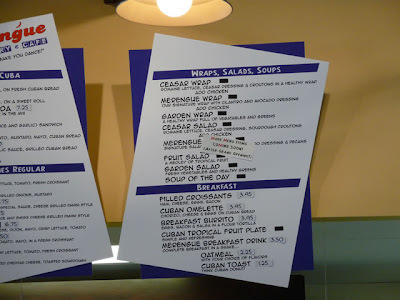 The Cuban sandwiches sound mouthwatering and the ones we saw people eating looked very good. The service is a bit slow and disorganized but the staff is nice so that makes up for it while they get adjusted. I overheard who I think was the owner talking with a couple of patrons and he was enthusiastically telling them how they use only the best ingredients, and how his cooks keep coming up with ideas for new things so he is going to continue adding stuff to the menu. It was obvious that he took a lot of pride in this new place and it shows. 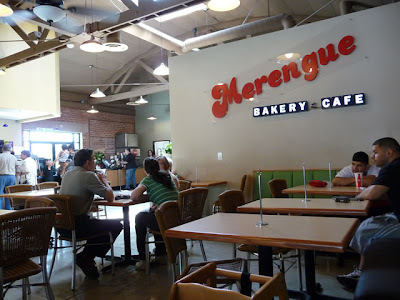 Is Merengue a Porto's wannabe? It's wares are similar to Porto's, but it is its own place. The food is at least as good, and I'm happy because it is a much shorter drive and its less crowded and hectic (at least for now, anyway; there were still a good number of people there). 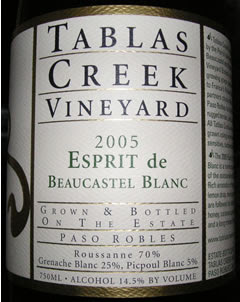 I paid $28.00 for this wine directly from Tablas Creek. I had been impressed with all of their wines that I have tried so far and this one turned out to be no exception. Initially there was a really fresh aroma that I had trouble pinning down - it reminded me of barbecue sauce. That is, the molasses and citrus part of it (like a Hawaiian barbecue sauce). That toned down to more of citrusy, flowery aromas as it aired. 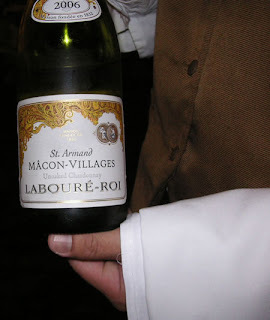 The wine had layered flavors of spicy lemon meringue, peach and pineapple with a pleasing sourish/tart aspect to it. There was a lingering lemony aftertaste in this well-balanced wine. Two unhesitating thumbs up for this multi-dimensional, very flavorful wine! Below is the matching multi-layered albeit short video. Click here if you can't see it. This wine came from Garagiste and set me back $16.84. The aromas were really nice, mainly of flowers, plus raspberry and strawberry fruit. That continued on the palate, along with a smoky, minerally aspect that I really enjoyed. There was a long, lingering fruit and mineral aftertaste. No need to wait on this one, it's drinking very well right now. The wine had an excellent balance of fruit and minerals, nicely offset by good acidity. I drank this one slightly chilled and it provided a great offset to the annoyingly hot weather we've been inundated with here in Southern California. Two thumbs way up on this one - it's a gorgeous example of a Beaujolais with loads of character at a decent price. Here is the matching YouTube video featuring someone else with loads of character. Click here if you can't see it below. Gee, I didn't even realize it but this past Tuesday (July 8) marked the ONE YEAR ANNIVERSARY for OneWinePerWeek! And it's been a blast doing this. Thank you, dear readers! I have had the fortune of drinking many excellent wines, a fortune made better by the fact that most of them were not real expensive. I was mulling this over the other day and it occurred to me that the factor that distinguishes a worthwhile wine from one not so worthwhile is if you can tell that the winemaker took pride in what he or she produced. Were they trying to be true to their own self, their own vision of what the wine should be, or were they following a formula or aiming for a certain result motivated more by $ than taste? There's nothing wrong with making a profit, certainly not a generous one either, but it should always come from a motive of quality and integrity, not from seeking profits above all else. 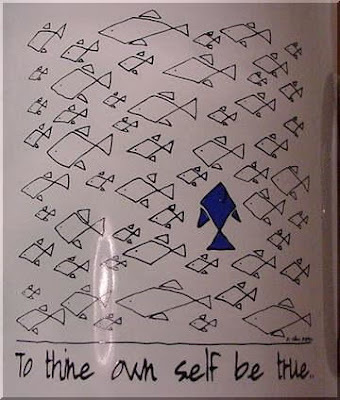 Above all else, no matter what a person does, the motto should be, to thine own self be true. You know, carpe diem and all that stuff (haha, just joking.. I know that doesn't mean the same thing but when it comes to latin, who can know for sure). That same motto applies to the bloggersphere as well. Does our writing truly reflect the vision of what we set out to do? Are we true to ourselves? When I first began this blog, I intended to just write reviews about the wines I drank and make a bit of small talk. Then the idea came to me to poke fun at various aspects of the wine world - to have some humor. Later, since I am so enamored of music, I added YouTube music videos to the wine reviews to try and match the wine with the music. Lately, though, I've been pretty dry when it comes to ideas for things to write about (oh, you don't have to tell us, it's obvious! You say..). Or at least along the lines of my original idea, to add some humor to the wine blogging arena. 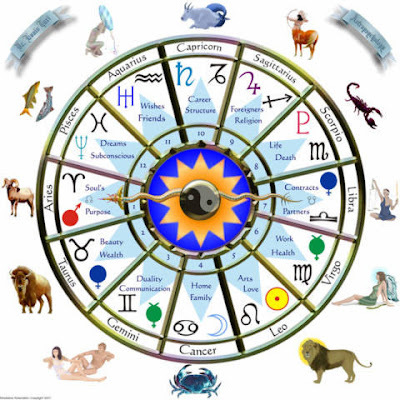 Like the post from earlier this week about Wine Astrology which I initially thought was a good idea until I actually started trying to write something along those lines. 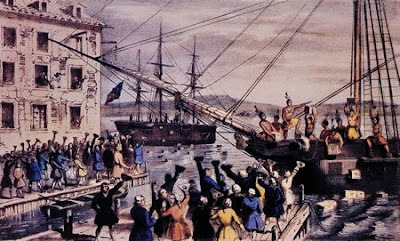 But, shudder, there it is up on the blog anyway. 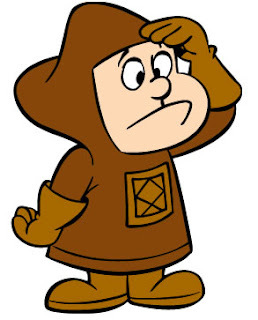 So what I am trying to say through all this rambling is that I think it's time for summer vacation! I've been drinking some wonderful wines and intend to keep posting reviews, but for everything else I think I need to recharge and refresh myself. Then when the inspiration strikes, uh, carpe diem! For whatever it's worth, I'm going to take a break from posting all but tasting notes/reviews for a season. By the way- I found the picture of those fish at this site. They sell mugs with that on the side - I like the design! This white Rhone blend of Grenache Blanc and Clairette was produced from organic, biodynamically farmed grapes. The aromas were initially closed but after some violent swirling I must have made the wine seasick so it coughed up some very nice flowery honeysuckle and pear aromas. On the palate the flavors were also initially tight but with some air time and swirling they turned really generous: Peach, peach pit, pears, with a pleasing apricot-like tartness and good, crisp acidity. There was a good balance between the full, rounded fruit flavors and the minerals and acidity that made for a great contrast. A minerally aftertaste trailed off fairly quickly. This made for some nice drinking in our already too-hot June! 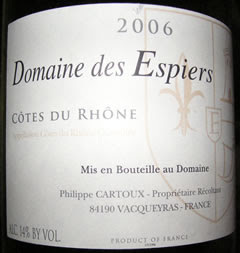 At $12.99 from Domaine 547, this easily deserves two thumbs up. Well worth a purchase! This was a rather unusual wine. It started out with immediate aromas that were exactly like a raspberry jelly roll - the mixture of the fruit and the cake. From there, a smoked meat aroma wafted in and took over. Lots of raspberry and strawberry fruit on the entry, that gave way to leather and soy flavors and a minerally, gravelly aftertaste. Initially the texture was a bit rough, with biting tannins. There was an uncommon flavor that I just couldn't put my finger on, though, and it came out only when chewing the wine for an extended time. At first I thought it was like very, very deep fruit but finally I recognized what it was: salmon skin and the dark part of a salmon that's between the orange meat and the skin. Weird, huh? I kept tasting it and the tasting kept confirming that impression. It may sound unpleasant, but it really wasn't. That's something I never tasted in a wine before! I started out with the wine a bit on the chilled side and that's when the salmon skin flavor was most prominent. As the wine warmed up, it dissapated. Don't let that characteristic scare you away, though! For $7.99 from Garagiste, I give this two thumbs up. It had lots of concentrated flavor and was quite complex, especially given the price. The Garagiste offering description says it was made from 30-50 year old Garnacha grapes. And as usual, here is the matching YouTube video (note: I matched the song to the wine based on the music, not on the title so no need to psychoanalyze anything, lol..). Click here if you don't see the video below. Why is it that one day you try a wine and it is absolutely fantastic, yet the next time you eagerly imbibe the same one, it disappoints? Sometimes it may be due to bottle variation but most of the time it is because of bad timing. The wine you chose was, on the first sampling, in line with the stars but the second time around, it was not. It's as simple as that. J. Addison, the Hedonistic Wino here - it's been a while since I've been cruising these pages but that's because I have spent extensive time developing the most wine-worthy products to enable you to reach the height of fine winedom. That kind of stuff takes time. And now that I am on proba- uh, on a roll, I proudly present to you the first of my annual editions of Wine Zodiac. 365 pages to guide you in your selection of wine are bound in this fine volume that begins not with the calendar or lunar year, but with the wine year: September 1. Each page has clear instructions as to what wine you are to drink for a particular date, depending on which sign of the zodiac you were born under. Use my book and no one will ever feel he or she was born under a bad sign again! Capricorn: What better way to begin the wine year than with a bottle of Goats Do Roam. Sagittarius: A wine from Amapola Creek, made by Richard Arrowood is in order. Scorpio: It is imperative that you drink a very young Sancerre, one with high, bracing acidity. Libra: It's your lucky day, today is wild card day for choosing a wine. Anything you choose this day will go your way. Virgo: Only a red wine may be drunk, and it must have a picture of an animal on the label. Leo: Whatever you do, make sure you drink your wine by yourself. Friends and acquaintances are not to be trusted today so also make sure the wine you drink is one that you personally purchased and did not acquire as a gift. Cancer: Be careful, too much alcohol is dangerous today. Make sure the alcohol by volume in the wine you choose today is under 13%. Gemini: What the heck, splurge today. Drink two bottles. As long as they are both the exact same wine. Taurus: Today you must select a red Burgundy, no ifs ands or buts about it. 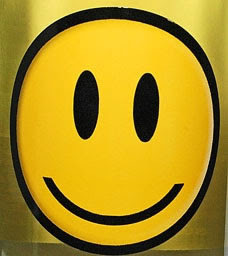 Aries: You must drink a white wine today, dry, and from a producer with a single word as their name. Pisces: Ignore any rules today about red wine with meat and white wine with fish and just drink whatever you feel like. Tomorrow it may not be the same, but today go wild. Aquarius: Unfortunately today you must drink something that tastes weak and watered down. Pretty much any inexpensive Italian Pinot Grigio would fit the bill nicely. But why Addy, you may be asking. Why these rules? Don't ask me, I didn't make them up! It is in the stars and immutable. Your good fortune is that I am passing this along to you so that you will drink the right wine at the right time. Don't get caught short - make sure you have my valuable book in hand before September 1 arrives so that you can begin matching your wines from the get go. The price? Extraordinarily reasonable. Is it not worth $1.00 per day to be able to ensure every wine drinking experience you have is perfect? Yesterday we had a lunch gathering at my sister's place, and one of her friends brought this wine. It certainly has a distinctive label! Since it is easily peeled off, it can be put to other uses, as well. I didn't know from where it was purchased or for how much, and given the label, I didn't expect that it was very expensive. The wine didn't have much in the way of aromas, and it had a lemony-pear taste that seemed noticeably sugary. The acidity was good and it was no oak monster so those were the plusses. 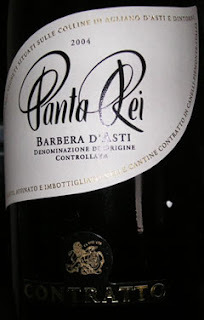 Overall, it was an easy-drinking, simple wine but had an artificial sweet character to it, sugary as opposed to fruity. There's one review for this wine on Cellar Tracker, from which I was able to gather that Trader Joe's sells it for $5.99. I also noted that the Oreana web site doesn't mention this wine at all (at least from what I can gather), and most of their other offerings are a lot more expensive than this one. This is the last of my three-part blog about our recent weekend cruise to Ensenada via Royal Caribbean's Monarch of the Sea vessel. 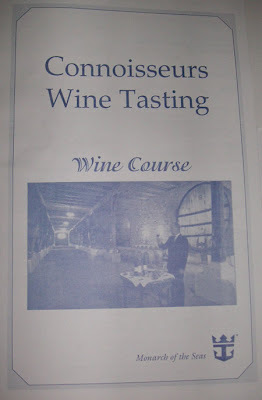 One of the day's activities was a wine course. For an extra $9.95 I felt it was my blogger duty to enroll and report back to my faithful three or four readers on what took place. There were about 60-70 of us placed at various tables in one of the dining halls. In front of us were three glasses, one for whites and roses, one for reds, and a Champagne flute. It was quite an international representation - the Vouvray from France, Sauvignon Blanc from Chile, Chardonnay from Robert Mondavi's second label, White Zin from California, Merlot from Australia, Shiraz from Australia, Tempranillo from Spain, and Korbel Brut to finish things off. I have to say the sommelier chose wines that were a good reflection of their type - each was distinctive. None was anything to rave about, but neither was anything bad. They were all very drinkable. My personal favorite was the Condesa De Leganza Tempranillo. There were four other tasters at my table, none of whom knew much about wine. They were all charmed by the Vouvray and made faces when they tasted the Sauvignon Blanc, staring at the glass not quite knowing what to make of it. It was clearly the black sheep of the tasting. That herbal/grassy character was too different for most people, especially coming after the sweetish Vouvray. I felt sorry for the fellow who led the tasting. I think I was the only one in the whole room who spit, and with each successive wine the room became noisier and noisier. By the halfway poiint or even before, hardly anyone was paying attention to him. He made a few futile attempts to hush the crowd, but, as I just said, they were futile. Most of what he said was accurate but he did say a couple of things that raised my eyebrows. Among them, a statement that the best vintages were 1994 and 1997, and in this decade, 2001 and 2006. He never said exactly which region or wine this applied to. Another thing he said was that white wines do not age, but all red wines get better the longer you keep them. I wasn't sure if he was just saying these things to see if anyone would react, or if he really believed it; I just kept my mouth shut and listened. At dinner the headwaiter recognized me from the tasting earlier in the day and asked what I thought of it. I said it was kind of noisy and I felt sorry for the person conducting the tasting. He nodded and said the poor guy used to make some threatening remarks to people but finally gave up. Resistance is futile, I suppose. It was a nice diversion and the wines were decent examples. For $9.95 it was worthwhile. It didn't seem like people cared much about learning anything, though. I had this wine during our Ensenada cruise last weekend. The waiter was nice enough to save the remainder each night, so this was consumed over the course of three evenings, Friday through Sunday. It was $26 from the wine list (plus 15% automatic gratuity plus tax). Retail price? I did some searching on the internet and came up with a range of $10-$12. On to the wine: initially it was pretty tight, with a lemon and herb/spice aroma and flavor. Flavors were simple and straightforward. The waiter corked it back up and stored it in the refrigerator each night. On the 2nd evening, the wine was the same as the 1st, so being exposed to air didn't seem to have an effect. On the third night, the wine had opened up. 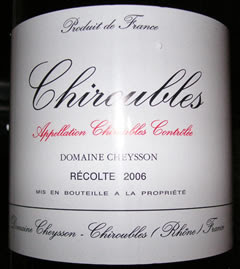 Fuller aromas, and a fruitier, rounder character on the palate made for a nice improvement over the first two nights. There was no oak to intrude on anything, and the acidity was nicely balanced. It was a good food wine and at a retail price of $10 to $12, worth drinking because of how it developed over the course of three evenings. Two thumbs up!